I DON'T ski and I'm seriously scared of heights. Completely acrophobic. So why would I be sitting in a tiny gondola, swinging in the breeze 100 metres above the Swiss Alps? I wish the answer was "having an absolute ball" but at that exact moment fun was the farthest thing from my mind. My immediate concern was whether my travelling companions minded that I had my head between my knees and my eyes screwed firmly shut. Or that I was gently rocking backwards and forwards mumbling "I'm in a happy place, I'm in a happy place". Tragic as that picture might be, I truly love the Swiss Alps and am willing to suffer the humiliation of very public attacks of acrophobia for the chance to experience it. Our recent visit to the village of Wengen, high in the mountains of the Bernese Oberland region, was our third - all of them in either spring or summer when the crowds are smaller, the wildflowers are in bloom and the mountains are perfect for hiking, rather than skiing. Cliched as it sounds, there is something magical about the Swiss Alps. Sure, the views are spectacular and the walking trails beautiful, but it's more than that. The mountain air is so clear that everything seems to sparkle. The smells are fresh (even the cows smell good) and high in the mountains is the only place in the world I can ever remember experiencing complete, absolute silence. During winter, the streets of Wengen are covered in a blanket of snow and the village is packed with skiers. But during the off-season when the crowds thin out and the sun is shining, it's the perfect base for anyone who wants to explore the Alps on foot. Don't get me wrong, there are still a few snow-based adventures high in the mountains, including a visit to the famous Jungfrau mountain with its science research station and tunnels that take you down on to the Aletsch Glacier. The cog train passes through Wengen on its way up the hill to Kleine Scheidegg and then into the middle of the mountain, through the Jungfrau Tunnel on the way to the highest railway station in Europe. It's an incredible trip and offers the added advantage of enabling hikers to get on and off the train to walk on their chosen paths. And there are plenty to choose from. Alternatively, the cable car from the heart of Wengen opens the door to vast alpine areas of Mannlichen, Grindelwald and First, enabling hikers to roam for kilometres with barely another soul in sight. The ride up is a torment for me and my fellow acrophobics but the "close my eyes and stick my head between my knees" routine has stood me in good stead so far. After dropping to my knees and kissing the ground, I find my heart rate soon slows down enough for me to enjoy the rest of the day ... before the ride back home. 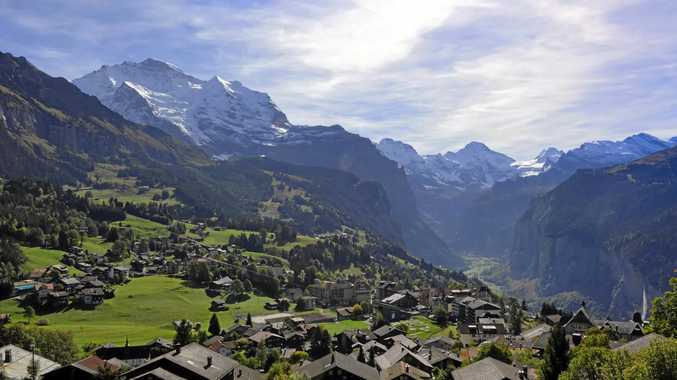 Directly across the valley from Wengen is the beautiful little village of Murren, which is the starting point for our favourite hike along the North Trail. Imagine hiking 10km across the Alps, through meadows full of cows and past remote farmhouses, with the Alps towering above you the entire time. Vantage points along the way offer amazing views of snow-capped peaks and there are many times the only sound is the gentle ringing of distant cow bells. And imagine the delight of coming across a farmhouse that appears deserted and locked up for the summer, until you get close enough to see the urn of hot water, tea and coffee sachets and a fridge full of milk, beer and juice with a small honesty tin for payment. To say the Swiss Alps is a different world is stating the obvious but it truly is a place that wraps you in a warm welcome and makes it very hard to leave. Except when you're sitting on a cable car, wishing you were anywhere else in the world. But those memories fade. The good ones will be with me forever.